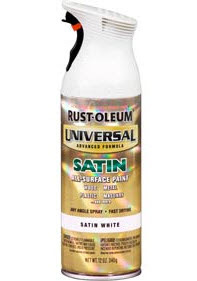 So they will all be treated to a nice spray with my favorite shade of white, Rustoleum Universal Satin White. I really wish this stuff didn't cost about a million dollars, but what are ya gonna do? It covers like a champ, can be sprayed upside down, and it doesn't come out a shocking bright white like some others, it's a more mellow white without being ivory. Think Kate Winslet as opposed to Dita Von Teese. A nicer shade of white. Oh my goodness, please ignore all the gross smears on it, the night time shot, the flash, the mess reflected in the mirror, etc, etc. The filigree portion is broken off the bottom right side, but I do have the piece and will be reattaching it. It will all be painted out the same color as our trim. I'm not sure where I will hang it at this point, but I just loved it and it was only $25! 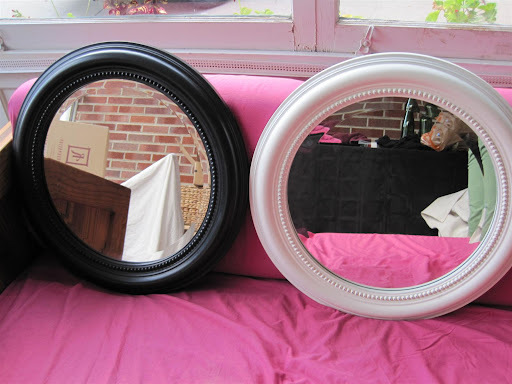 Tomorrow I will post some 'afters' of these mirrors as they are done. Then maybe you can help me figure out where to put them? I also have a rather large furniture painting project in the works, more info on that to come! The one from Goodwill would look awesome turned horizontal! I love finding mirrors and frames and refinishing them. Good call on the Satin White - that's my favorite too. Can't wait to see the after shots! 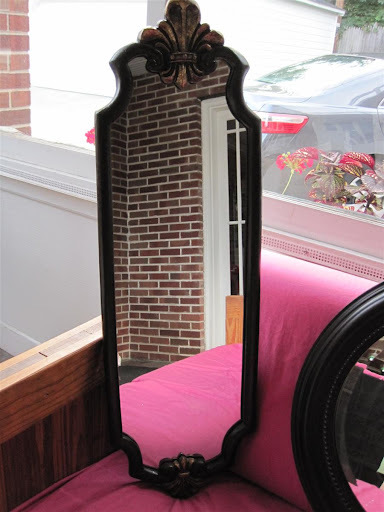 i have your mirror's brother! 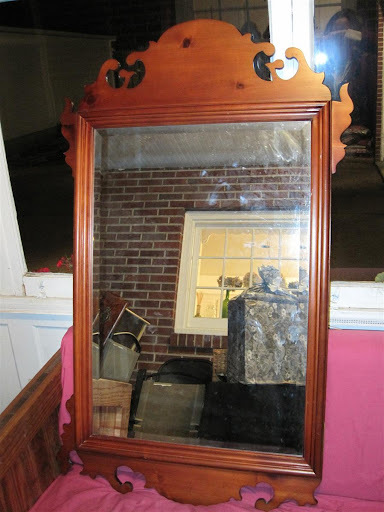 from an estate sale- and awfully torn up (think more things broken and i didn't have the stuff to glue them) but for a mere $5 I could care less if the mirror was cracked haha - yours is bigger and AWESOME and practically PERFECT in the den!! !